Luther, Calvin, Cranmer, Fox, Knox, Wesley, Whitfield, Spurgeon… Paisley. He would balk at the proposition, but it is no exaggeration to say that he now takes his place in a long line of Protestant Greats. Ian Richard Kyle Paisley was born into a Baptist manse and steeped in Unionist politics. He was educated at the South Wales Bible College, the Reformed Presbyterian Theological College in Belfast, and Bob Jones University in South Carolina, where he earned his doctorate. Disillusioned with Ulster’s newspapers, churches and political parties, he founded one each of his own – The Protestant Telegraph, the Free Presbyterian Church of Ulster, and the Democratic Unionist Party, which were basically all one and the same. Such arrogance and hubris is usually a recipe for spiritual oblivion and political obscurity: for Ian Paisley, they led to him becoming an MP in Westminster, an MEP in Brussels, an MLA at Stormont, and First Minister of Northern Ireland. Like Moses, he spent 40 years wandering in a wilderness of Anglo-Irish appeasement and Good-Friday obfuscation. But, unlike Moses, he lived to lead his people into the Promised Land of power-sharing and peace. And he did bestride Ulster like a colossus, Bible in one hand and ballot papers in the other. If you believe the British media, he was a much loathed and embittered bigot. If you bother to listen to reports of his name and accounts of his reputation in North Antrim, in the whole of Belfast, or even in the whole of Northern Ireland, you would hear people from both sides of the sectarian divide talk fondly of the “Big Man” as a loyal servant; a great soul of humility; a man of honour who had time for people; a pastoral disciple of the Lord who prayed, listened and cared. He also wrote dozens of books, preached thousands of sermons, (even about His Grace), and founded a European Institute for the understanding and propagation of Protestant Christianity. Imprisoned in 1966 for provoking a riot, in solitary confinement he wrote the highly-regarded Exposition of the Epistle to the Romans. The scope of his life is epic; indeed, it is the stuff of Hollywood (and ought to be). In a nebulous age of ubiquitous relativism, there simply aren’t any politicians left who have risen to the most senior echelons of power without compromising their Christian beliefs. 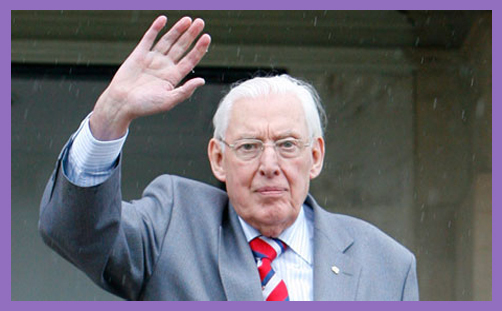 And Ian Paisley was a “No Surrender” Protestant Christian, of that you could be in no doubt. So Protestant, indeed, that he would dare to display in the chamber of the European Parliament banners denouncing Pope John-Paul II as the Antichrist. In his final speech there, he called the institution “the new Tower of Babel”. For him, priestcraft, superstition and papalism were synonymous with corruption, deception and desecration. This was his historical theological conviction: it was also his political motivation in the preservation of liberty, justice and truth. Some, of course, would call it bigotry. But it is a strange kind of bigotry which will sit down with a terrorist, a sworn religio-political opponent, even a mortal enemy, and work in partnership for peace. When Martin McGuinness became Ian Paisley’s deputy following the St Andrews Agreement, something happened not only politically, but spiritually. The transformation was astonishing; some might say miraculous. Here was the “No Compromise” Ian Paisley of the Protestant DUP not only sharing power with Adams and McGuinness and Nationalist Sinn Féin, but the “Chuckle Brothers” were even praying together. In failing health, Dr Paisley stood down as First Minister after just one year; he resigned as leader of the DUP after 37 years; and preached his final sermon as Moderator of the Free Presbyterian Church after a colossal 65 years. Some 3,000 gathered for the occasion, and they came from the four corners of the Province. Dr Paisley was made a life peer in Gordon Brown’s Dissolution Honours List, taking the title Lord Bannside. In retirement, he had embarked upon his memoirs. When His Grace met with him last year, there were requests for papers and DVDs which only His Grace possesses. Dr Paisley had publicly announced that he would be “telling some stories that will make some people laugh and others blush”. It is a cause of great regret that these may now never be told. His Grace so much wanted to know which “well-known Roman Catholic priest” asked the IRA to assassinate Dr Paisley; which British Secretary of State for Northern Ireland wanted troops withdrawn well before the Troubles were ended; and which member of the Irish Cabinet thought that “had the Brighton bomb succeeded, it would have been better than 1916”. But these matters are now as nothing: they are dirty rags before the Throne of Christ. His Grace’s thoughts and prayers are with Baroness Paisley, and also with Sharon, Rhonda, Cherith, Kyle and Ian Jnr, to whom he sends his sincere condolences. Well done, thou good and faithful servant: thou hast been faithful over a few things, I will make thee ruler over many things: enter thou into the joy of thy lord.